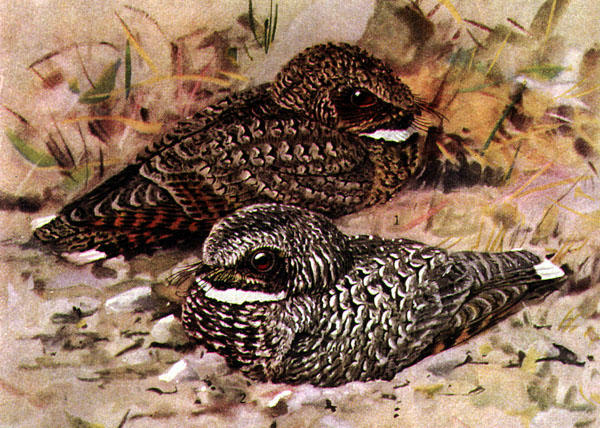 Common Poorwill, Phalaenoptilus nuttallii, offset reproduction of watercolor. Nominate race in foreground, Dusky Poorwill, Phalaenoptilus nuttalli californicus, in background. Many people have heard them, for their repeated “poor-WILL” calls are a familiar element of warm spring and summer evenings in the desert. But few have seen them up close. Poor-wills sleep all day, then wake up to hunt moths and other insects on the wing at night. In 1946 the eminent desert biologist Edmund Jaeger did happen to find one in a Southern California canyon. The odd thing was that it was winter, and the bird was deeply asleep. Jaeger returned to the same canyon three winters in a row. He found that the poorwill returned to the same rocky hiding place each year for three months. It took only slight breaths, had no perceptible heartbeat, and its body temperature was 40 degrees Fahrenheit lower than normal. Jaeger wasn’t the first to notice this: Hopis call poorwills “the sleeping one.” Come the first warm evening in late winter, they rouse from their deep sleep and announce the coming spring once again.